A young boy releases coho smolts into Hoy Creek at the 2017 event. 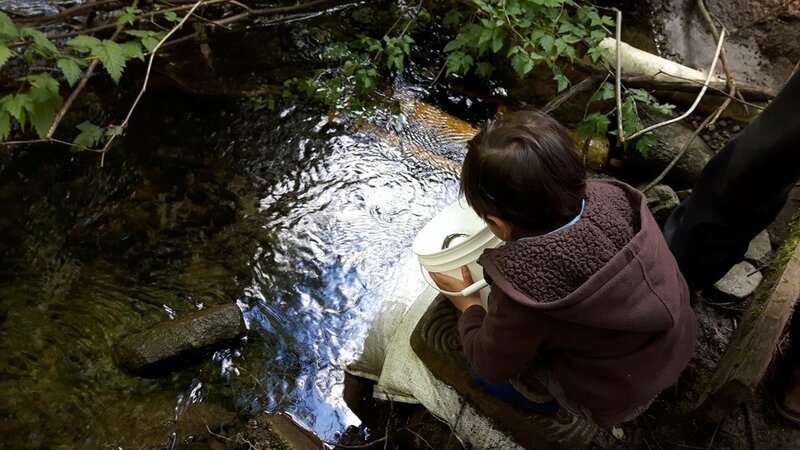 Join the Hoy-Scott Watershed for Salmon Leave Home on Sunday, May 6 and help release coho smolts into Hoy Creek. Activities get underway at 11 a.m. and run through to 2 p.m. at the Hoy Creek Hatchery. It's a great family event and takes place rain or shine, so dress for the weather! The Hoy Creek Hatchery is located on Hoy Creek Trail, west of the City Centre Aquatic Complex at the corner of Pinetree and Guildford Way. Simply Google "Hoy Creek Hatchery" to locate.